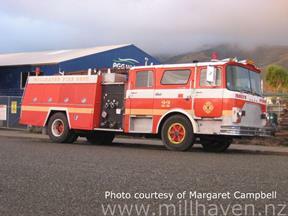 The Tapanui Fire Station (home to the Tapanui Volunteer Fire Brigade) had a quick change of signs to become the Millhaven Fire Station. A Douglas County Mack fire engine arrived for the filming. 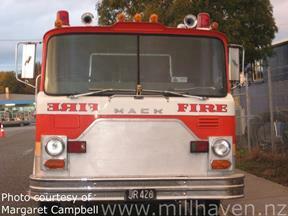 This machine is listed as part of the Wellington Fire Museum collection as a 1978 Mack CF685, having served in Wellington, Wellington Relief, Gisborne and Paremoremo. The New Zealand registration of JR426 appears in these photos.